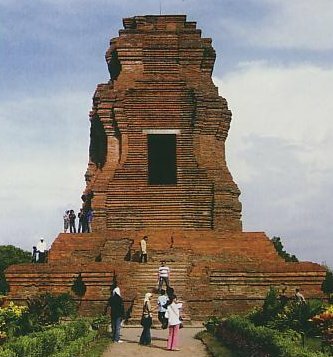 Kutai is one of the oldest kingdom in Indonesia, is expected to appear in the fifth century AD or ± 400 m, the existence of the kingdom is known based on news sources found in the form of inscriptions in the form yupa / total 7 pieces of stone pillars. Yupa Pallawa that uses letters and Sanskrit, we can conclude about the existence of the kingdom of Kutai in various aspects of culture, including political, social, economic, and cultural. In political life as described in yupa that the greatest king Kutai is Mulawarman, son Aswawarman and Aswawarman is the son Kudungga. In yupa also explained that Aswawarman Ansuman referred to as god / god of the sun and is seen as Wangsakerta or founder of the royal family. This means Asmawarman has embraced Hinduism and is regarded as the founder of the family or a dynasty in the Hindu religion. For that experts think Kudungga still original and still the name Indonesia as head of the tribe, which lowers the kings of Kutai. In social life is established harmonious relations / ties between King Mulawarman with the Brahmans, as described in yupa, that the king Mulawarman 20,000 cows give alms to the Brahmans in the holy land called Waprakeswara. The term Waprakeswara - a shrine to worship Lord Shiva - the island of Java called Baprakewara. Economic life in Kutai, not known for certain, unless mentioned in one inscription that King Mulawarman have held a ceremony to award the victim of gold and not as many as 20,000 head of cattle for the class of Brahmins. It is not known with certainty the origin of gold and cattle have been obtained. If gold and cattle are brought in from elsewhere, can be concluded that the kingdom of Kutai had engaged in trade. In cultural life can be said to have advanced the kingdom of Kutai. This is evidenced through penghinduan ceremony (blessing of Hindu religion) called Vratyastoma. Vratyastoma carried out since the government still maintains Aswawarman because Kudungga Indonesian characteristics, while leading the ceremony, according to experts, is always to the priests (Brahmins) of India. But during the ceremony penghinduan Mulawarman presumably is led by pastor / the Brahmans of indigenous Indonesian. The existence of the original Brahmin Indonesian people to prove that high intellectual ability, especially the mastery of Sanskrit language which is basically not the language of everyday people of India, but more an official language of the Brahmans for religious issues.